We enjoyed our final shower on the wrong side of the Channel this morning before preparing the vehicle for off, including dumping our grey waste water. I timed it well as the 'Tank Full' alarm went off just as I finished my shower. First we headed out to Wancourt (yup it had a 't' in it) to take a look at the village before stumbling upon the Wancourt British Cemetery. Oddly enough, despite its title there were a number of Canadians buried there. We were able to find a few unnamed graves of the Suffolk Regiment of which the distant relative belonged to. After that we drove to the second village and took a few photos. As it was now gone 10:00 and the Wellington Quarry would now be open, we made our way there as I wanted to buy a book the manager had shown me. On arrival, typically of course, I couldn't find the book anywhere and I had looked through them all twice. So with all that time and effort wasted we started making our way to Calais for our 17:55 sailing on one of Mr Peando's Multicoloured Ferryboats, where, as usual we'll make the crossing without hearing one word of English spoken. We had good intentions of using the 917 'A' road from Arras to Calais but as usual I became fed up with the hazards along the way and the lack of progress, so it was on to the toll road for a final rip-off totalling €12.40, cheap when compared to other days. We've now arrived at the Cite Europe shopping complex next door to the Euro Tunnel terminal. We've popped in to the Carrefour supermarket to stock up on a bit of rosé wine. Then it was off out again for a meal. Having now returned to the motorhome we've a couple of hours to wait before ambling down to the Port for our crossing. Nearly 6,000 miles travelled in ten weeks, some over the crappiest roads imaginable and I've no idea how many countries we passed through, some more than once. Was it worth it? Well I have to say it was very testing at times, and often could have just murdered a fag, but we survived both the journey and each other. I'm sure we annoy the hell out of each other at times but there's nobody else I could or would have made the journey with. Considering that for most of the time we only had each other for company I think we did pretty well. We've now spent six months out of the past nine and a half, living in this confined space together. First it was a month in Belgium and France, and then it was three months in Spain for the winter and now this little two month jaunt. We’ve agreed not to go on any more long trips until we’ve sorted out our garden at home by making it low maintenance so that we don’t let the neighbours down by having it look untidy with weeds etc due to our absence. The motorhome has also been in storage since we purchased it a couple of years ago and I am now very keen to get sorted so that it can live on our driveway instead. We’re not going back to Southern Spain this winter as, although we don’t do very much at Christmas, what little we do, we missed and so in future when we go that way we’ll set off at the end of December or beginning of January. That makes the next likely trip France, Switzerland and Germany, early next summer, and we won’t mention ze voor. I had a bit of a lie-in this morning. I didn't intend to, it just worked out that way, which meant that after showering and having breakfast we had to crack on with the day’s jobs. Firstly it was the British Cemetery and Monument on the edge of town. We were hoping to catch the freebie minibus that circles the town but couldn't find a bus stop for it. Instead I had to lug the cameras and Mac's (it was a bit cool and cloudy with spits in the air) all the way there in my backpack. Once we arrived we set about taking some photographs and video shots. The biggest disappointment was the difficulty in reading the names higher up on the wall of the Monument. 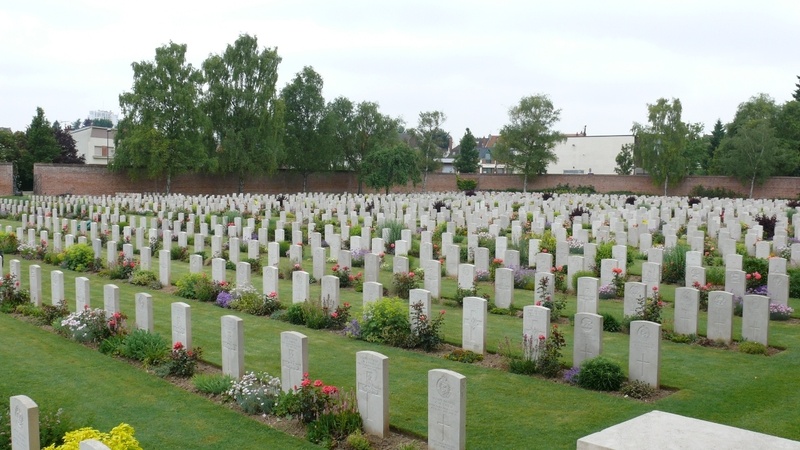 Basically it started off as a cemetery which the Brits began filling with British and Allied bodies as soon as they took over the administration of Arras. At the end of the war the French bodies which were there were removed for reburial in their own cemeteries, and where they had laid, the Monument element of the site was created. There is one to the fliers of the war, lost in battle, and walls constructed on which the names of something like 35,000 names are engraved. These are the names of those with no known grave, which includes my distant relative. In the light we had to work with, if we stood close to the wall and looked up we couldn't read most of the names up high. If we walked backwards far enough we could see the names, but from that distance they couldn't possibly be read. In the end we came up with a cunning plan. Rosina was the spotter. Once we had identified where his name was using sharp eyes and the zoom lens on the camera, we marked the spot with the end of the video camera's monopod and then took the pictures. That done we were going to look at the Citadel next door but today was its first day of closure for maintenance work. They're probably tidying it up as the 'Tour de France' passes right by both the Citadel and Cemetery on 8th July. Back in to town then for a spot of lunch. Today it was to be a toasted ham sandwich with some rabbit food on the plate. We also ordered one portion of fries to share between us (being a tourist is not only expensive but also hard work). The fries never arrived and my lettuce was covered in some ghastly dressing. The Yanks are just as bad, they can't leave food alone, the number of amazed looks we got in America when we told waiters we didn't want dressings. To them it was simply unheard of not to have perfectly good food disguised with blue cheese dressing etc etc. When Rosina went to pay the bill the fries were included, so she put them right and we didn't leave a tip. After lunchiepoo's I wanted to go up the Bell Tower at the Town Hall for a few video shots from up high. The Chef isn't a big fan of heights, and besides which she had forgotten to get the chicken pieces out of the freezer for tonight's chicken curry. So she made her way back home. I then went in to purchase a ticket for €3 and my own personal humiliation. Having bought the ticket I went down the stairs to catch the lift to the top, well the top barring a further 40-odd winding steps that is. So there I was having found a wrought iron gate filled in with clear Perspex for security I suppose. I could see a turnstile through the door and the entrance to the lift. I stood there for ages assuming that the lift must have an attendant who would bring it down with a group and then take me up. There was an intercom on the wall and I wondered if perhaps I should press it to tell them I was there and waiting for a lift, then thought better of it. After further waiting I tried pushing the door - nothing, so back upstairs to the Tourist Office reception desk I went where a very pleasant young lady explained the problem to me, and seeing the disbelief on my face came downstairs with me. Then all she did was hold the handle on the door and PULLED it open! A point to remember then, if a door doesn't open when you push it, try pulling it. I had the lift all to myself and up I went. It was a bit breezy at the top; in fact the closer we've got to the UK the more the weather has seemed like a typical English summer. I did my video shots and then made my way back down and home. On my return I filled the fresh water tank back up to about half full, enough for our showering needs etc for tonight and the morning. We will then be securing everything and making our way to Calais. It's a good thing we checked the ticket this evening as I was certain that I'd booked another very late crossing, but for some reason I booked it for 17:55, so it looks as if we'll be arriving back home tomorrow evening. Tomorrow will be a long day, but before leaving this area I want to pop back down to Wellington Quarry and buy a book, and then drive to the village area about five miles away where the relative most likely fell, and still remains out there. On checking a map at the Tourist Office I spotted that 'Wancour' does in fact have a 't' on the end of it, so I'm wondering if the Manager at the Quarry was having a laugh at my expense when he photocopied his diagram for me. Tomorrow we will find out for sure. This evening was spent watching the film 'Jersey Boys' based on the life of Frankie Valli whose music I very much like. Rather disappointing, and nothing like as good as the stage show. It was directed by Clint Eastwood who perhaps should have stayed as Rowdy Yates in 'Rawhide' or Dirty Harry. The night was very peaceful apart from one single solitary fly that kept buzzing round. After absolutely ages I caught it - it had landed on my forehead and so I slapped it, job done but it stung a bit. As we have a full tank of water and are parked next to the tap and dumping point we can have a shower every morning that we're here. Once scrubbed and fed we made our way down through the town to the Wellington Quarry. 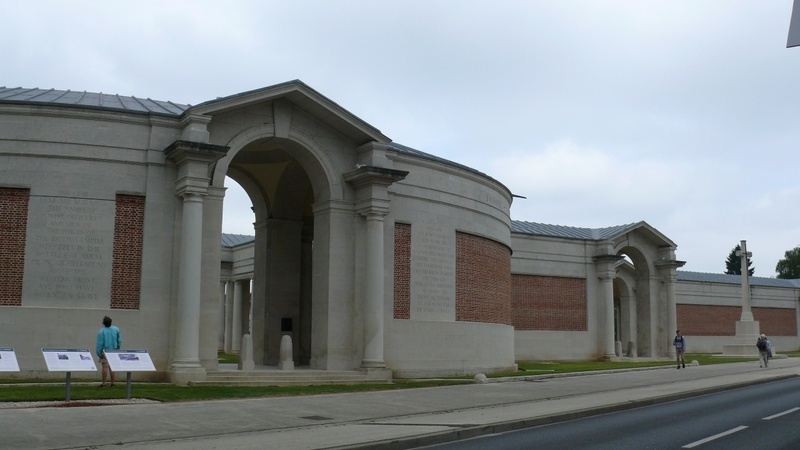 This is where my relative would have been billeted prior to the Battle of Arras, the spring offensive of 1917. Basically Arras was right on the Front Line and so to surprise the Germans, New Zealand tunnellers, mainly Maori miners, assisted by Yorkshire coalminers, dug a tunnel from Arras town centre out to an underground quarry site, probably about ¾ mile away, then they joined all the existing mining tunnels together and hey presto - underground accommodation for up to 24,000 troops. They were fed in to the quarry up to eight days before the battle. On Easter Monday, 9th April 1917, with sleet falling, they charged out of the quarry to attack an unsuspecting German enemy. This was to be a diversionary attack to draw reserve German troops towards Arras allowing the French to mount the main attack much further south. Well the French being the French, beggared up their advance, and after a few very successful days, our lot took one days breather, which allowed all those reserve German troops to turn up unchallenged, who then went on to give us a bit of a spanking. 'Lions lead by donkeys' wasn't it? On arrival at the quarry reception desk we were met by a very jolly manager and his staff. He asked where we were from and then he proudly announced that he was first away in the 'Tour de France' when it started off from Cambridge. Though when he showed us his photographs he wasn't in Lycra, more like Sillywear, on an electric scooter which was brightly decorated. It seems that he was there to promote Arras as a tourist destination. Well in all honesty, if there hadn't been The Great War then nobody would have any need to visit this area of France at all, or much of Belgium either come to think of it. So maybe, just maybe, The Great War was orchestrated by the French and Belgian Tourist Authorities; I mean they've never looked back since have they? The manager was also very helpful in that he took what details I had of the relative and whilst we were having a guided tour around the tunnels, did a bit of research and was able to pinpoint the most likely place that he lost his life, which is in the area of two villages about 5 miles out of town. One of them is called Wancour, I kid you not. I need to find out how that's pronounced before we send it to the Aussie next of kin. I tried it on for a bit of discount on the tickets as it did say 'concessions', though The Chef thought that applied to children and students. I loved the managers reply, he said "No - Tickets for old people cost more, because you don't move as fast, and it therefore takes longer to get round, plus you keep forgetting what we tell you and so we have to keep repeating it" - love the man, I thought it was hilarious. As a matter of interest, because English folk, especially in Yorkshire, embraced last year's UK sections of the Tour de France so enthusiastically, it will be announced that half of the 2018 Tour de France will be staged in England, Scotland, Ireland and Wales to commemorate the end of The Great War - You heard it here first! Get down the bookies and put a couple of quid on it, as well as George Michael in drag to win next year's Eurovision Song Contest, and if you want a real outsider for some kind of three-way bet, then it's Yorick for his performance in 'Hamlet' winning 'Best Actor'. I don't know what the pictures or video bits will come out like as the video camera was struggling much of the time to focus in the low light, still at least we tried, and when I pluck up the courage to download The Chef's photographs tomorrow I'm confident that there won't be any blurred trees or crash barriers in there. Because the manager of the Wellington Quarry charmed us in to buying a two-attraction ticket we spent the late afternoon back down town at the Exhibition of Archaeology of the Great War. Quite interesting but not really worth the additional expense and effort of going there. Walking through the town squares making our way back 'home' for lunch, every man and his dog was eating and drinking in the pavement cafes and restaurants, and what were most of them eating? Chips, chips with everything, I kid you not. Having passed an unpretentious fast food joint we saw what others were eating and the next thing I was sitting down to a char grilled chicken and salad thing in a long stick with chips and The Chef had a mini burger in a bap and chips. We walked away from there feeling completely stuffed and wishing we hadn't succumbed to the temptation. Still at least we can honestly say we ate what the French ate today. Tonight we've been joined on the Aire by one or two self important 'Hyacinth Bucket's and their husbands. Who, on seeing that the aire is clearly full, obviously feel that there really should be space for timportant people like them, and so parked one behind the other near the exit, making it difficult for those needing to dump waste water and exit the aire in the morning to do so. We're staying another night as we're going to visit the British Cemetery tomorrow, so it won't affect us otherwise there may have been a Victor Meldrew moment this evening. As we're still so stuffed from lunchtime I'm just having some crusty French bread and a glass of wine, I couldn't face another meal.